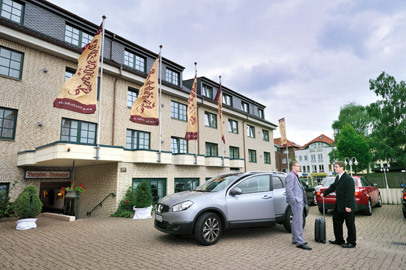 Our comfortable three-star superior hotel of tradition is situated in the heart of Dormagen – only a 15 minute’s drive from the economic metropolises Cologne and Düsseldorf. An ideal residence for the pretentious guest. Business travellers, families or travel groups find an exceptional ambience with modern comfort here – for rest and relaxation. On more than 5000 square metres we offer 81 single and double rooms, 2 studio flats as well as luxury suites with marble bathrom to our guests. In our internal restaurant “Reissdorf em Höttche” we daily serve specialities of Cologne and Rhenish specialities. The “Gastraum Silberdistel” in our hotel of tradition lets you enjoy varying international meals. Our event room “Rotisserie” is best suited for private and business celebrations as well as for conferences and meetings. During the summer months, our comfortable terrace invites you to enjoy life in the open air. 100 parking spaces and an underground car park are available to our guests. Enjoy your stay and relax at a hotel with an exceptional ambience and plenty of comfort. 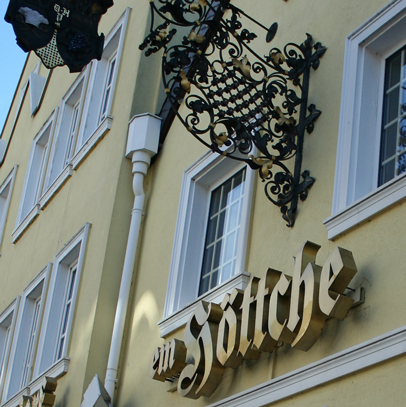 Welcome in the three-star superior Hotel Höttche – the comfortable hotel of tradition. Family Pandzic and the team of the hotel are looking forward to welcoming you at the restaurant and hotel Höttche.